My Northern Garden is being transplanted! I’m moving (with much help from local computer guru, Sean Hayford O’Leary) to http://mynortherngarden.com. The original site will continue to be available for some time, but the information will also be available in the new location with plenty of new posts about garden trends as well. Phase one of the monster snow storm hitting Minnesota and the rest of the Midwest this Christmas forced the postponement of some family plans for Christmas Eve, so I spent the day snow-blowing the driveway, baking cookies with my daughters, and admiring the snow shapes that form on the plants in the yard. 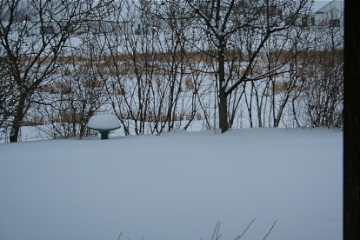 After the next wave of snow hits (15 to 19 inches predicted for Northfield), I may not be able to see any of my perennials or even this birdbath! With as many new plants as I have this year, I was deciding whether to put some mulch around them. No need now! We got about 8 inches of new snow (my estimate) and lots of blowing and drifting during the storm that is still marching across the Midwest. 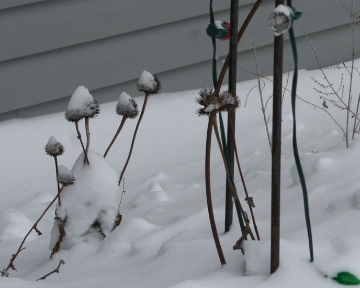 As a result, my newest bed looks to be under about 2 feet of snow, and only the tops of these coneflowers are visible. They do look good in their caps, however. A note about mulching plants in winter: The idea of mulch is not to protect a plant from freezing. Unless it is inappropriate for our zone, the plant can handle freezing without a problem. The purpose of mulch is to protect the plant from heaving out of the ground during the thaw-freeze cycles that we get throughout the winter. While the layers of snow on my plants could certainly melt over the next few weeks, exposing the plants to the worst of Minnesota’s winter and lots of thawing and freezing, it’s not likely given we are heading into the coldest time of the year in Minnesota. While blizzards are terrifically inconvenient (although my daughter and I will get our Christmas tree up and decorated today due to the day off from school), the snow is very welcome here. 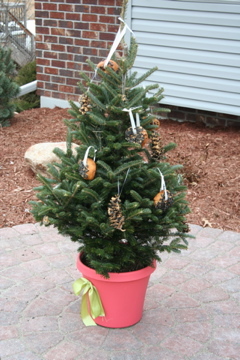 This weekend, I finished up the last of my outdoor holiday decorating with a Christmas tree for the birds. I’d seen suggestions for these on a few birding and gardening web sites and thought it would make winter more exciting if we had some birds to watch outside of the front window. After reading several articles on how to make a tree for the birds, I consulted with my friend, Penny, and the fellow she refers to as “the resident bird expert.” Lucky I did, because the resident bird expert warned me off all suggestions of stringing cranberries and other fruit for birds. The birds that like fruit are long gone from here, he said, leaving only true northerners behind — birds who like fat, protein and carbs. You can create all sorts of decorations for your tree, including the standard pine cone with peanut butter and seeds and balls of suet and seeds. The suggestion that caught my imagination, however, was one to use stale cake donuts as carriers of fat and protein for the birds. The instructions called for melting a cake of suet, then dipping the stale donuts in the suet and rolling it in seeds. 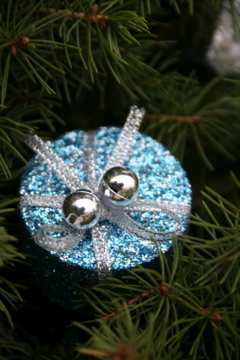 I had already prepared a pot for the tree and planned to use the tree I’d bought earlier for other holiday decorations. I started work on the ornaments Sunday afternoon, melting my suet, rolling the donuts, and watching the seeds fall right off. (This just goes to show, never trust anything you read on the internet!) Frustrated at how this was going, I took a break with a cup of coffee and a stale donut. It seemed the seeds needed more traction, so I added peanut butter to the melted suet. That didn’t work either, so I just gave up and spread peanut butter on the donuts and dipped them in seeds. Voila! I used the melted suet/peanut butter mixture as glue in a few pine cones, which I filled with seed, and when the mixture was cool, rolled what was left into little balls. The bird expert says it may take two weeks or so for the birds to find my tree and start frequenting it. Fortunately, we live in a neighborhood with very few squirrels — an oddity relating to the newness of the area and the location of three ponds. 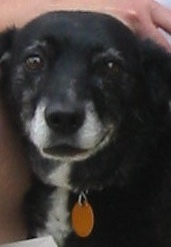 Unfortunately, our dog, Lily, found the tree right away, and already snarfed one of the donuts. She’ll be on leash from now on, and we can hope the birds will get at least a few of the treats on the tree. 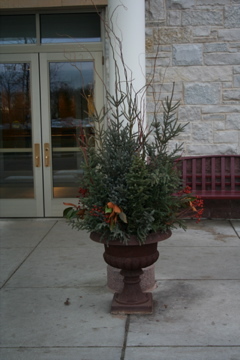 For more ideas on holiday decorating, check out the November/December issue of Northern Gardener. 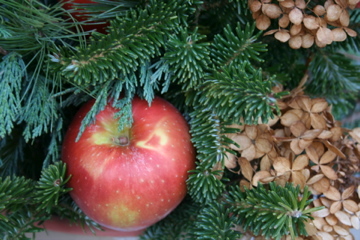 Julie Scouten has a great article on how to make decorations using garden supplies and greenery. What’s Hot in Holiday Pots? Judging by the decorations Northfield merchants are putting out for tomorrow’s Winter Walk — an annual shop, sing, meet, greet event that is enjoyed all but the city’s most Scrooge-like residents — the hot items in holiday container decorations are: spray paint, whimsy and lots of texture. While taking photos downtown, I observed Mary Closner of Swag spray-painting away at her lovely blue and silver outdoor container. Inside the shop, she had last year’s Christmas tree on display. After it lost its needles, she had spray-painted it red. Cute! 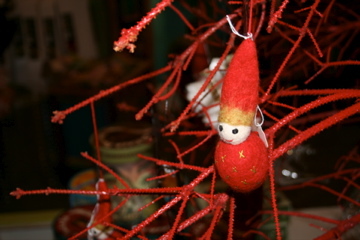 The stuffed ornaments from Sweden add a homey touch. The display outside the Northfield Historical Society also featured spray-paint as a stand-in for the snow we do not have yet. For whimsy, how about the little packages the folks at the Hideaway Coffeehouse and Wine Bar had tucked into their usual evergreen sentinels outside the store? That’s an easy decoration idea anyone with an evergreen and some ribbon could try. Texture is everywhere, in the mixed greens in the pot outside of the Monarch, in the rough narrow branches festooned with pink lights outside of the Glass Garden, and in the more sedate and natural-looking pots outside of Buntrock Commons at St. Olaf, where the thousands of visitors to the St. Olaf Christmas Festival will get their lefse and lutefisk this weekend. Ready for the big festival. Holiday containers are all about texture. 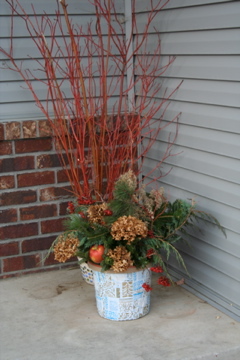 With the weather about to cool way down, I didn’t want to wait to put together a mixed holiday container. It’s easy to spend a lot on items like packaged spruce tips, curly willow sticks, red twig dogwood and even faux berries and poinsettias, but you can also do a mixed container for very little money. For this mixed container, I started by using a collage technique to decorate the plastic pot with holiday paper. This takes a day or more to do, so over the weekend, I also gathered the fixings for my pot. I bought a small Fraser fir Christmas tree for $15 (this will be used in another project as well) and cut the bottom 1/3rd of the branches off for the main greenery in my pot. The Fraser fir has kind of two-toned needles, which adds a nice texture to the pot. 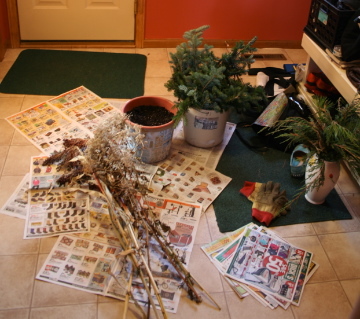 I also walked around our yard, cutting stray branches from a swamp white oak and a mugo pine. 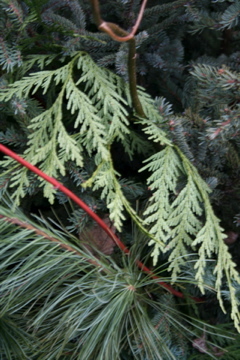 I like the wispy look of red cedar in holiday containers, but don’t have any in our yard. We do, however, have a very mature creeping juniper, so I snipped some wisps from that to use. 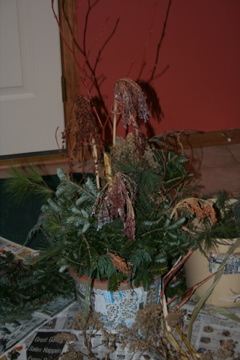 I had some left over grasses that I had used in a Halloween display as well. The grasses had a large reddish seedhead, so I thought they would add something to the pot, too. This morning, assembly began. First, I filled the pot with leftover potting soil from this summer and began building the greenery around the pot. I started with the Fraser fir, then added in the white pine, the mugo, and the juniper for accents. It looked pretty good, fluffy and green, with a fair amount of texture. Then, I added in the red-headed grass (if anyone knows what this is called, please let me know through the comments) and some Joe Pye weed from the garden. I tried several ways of placing it, but no matter what I did, the grass looked, as my husband said as he left for work, “dead and sad.” That’s not what we want this time of year! With the grass out, I needed something else to brighten the pot. This is the first year I’ve had hydrangeas and I’ve been looking forward to seeing the snow on their broad flowerheads, but it seemed a good idea to sacrifice some of them to the pot. The tannish brown color contrasted nicely with the greenery and the flowers added another texture. The pot still needed some brightening. The pot has a natural look to it, so ornaments and ribbon seemed out of place. Instead, I put skewers into a couple of apples and stuck them in the front of the pot, and cut several branches of berries from a high bush cranberry bush. 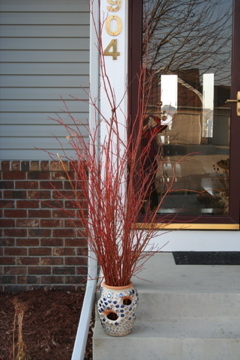 The finished product contrasts nicely with the tall red-twig dogwood display and gives a cheery look to our front porch. It’s easy to spend a lot of money on holiday decorations for inside and outside of your home — but it can also be done on the cheap, and my goal this holiday season is to come up with a few nice decorations that don’t cost much money. Here’s the ultimate cheap holiday pot: It cost nothing. A couple of weeks ago, I trimmed back some decidedly overgrown red-twig dogwood bushes. While many of the branches went to the county brush pile, I picked some of the longest, straightest, and brightest for use in outdoor holiday decorations. For this simple pot, I took a good-sized bunch of branches and set them in a strawberry pot that otherwise would spend the winter in the garage. Ta-da! A decorative holiday pot.